What do you think about reviews? If you could pick anyone, alive or dead, to review this book, who would it be? Why? As a critic and reviewer, I’m obviously biased, but I love reviews. I think they fill a really integral niche in the discourse about stories, and when done well—not a book report, but a true investment of thought, a sort of dialogue between the critic and the text—they’re also an art in and of themselves. I buy a lot of books based on reviews—sometimes because what the reviewer hates about the book, I know I would love, and sometimes the opposite. As for reviews of my own work, I’m always intrigued by seeing what other people read in the text I made; there’s always a gap between intention and reception, and seeing how the books or stories are read is interesting for me on a critical level. For anyone who’s skeptical about book reviews, go and read the collected reviews of Joanna Russ in The Country You Have Never Seen. That’s what good criticism can do. And on that note, is it sort of obvious that I would answer, Joanna Russ? Because yes, if I could choose anyone, I would choose Russ. She might have thought Beyond Binary was an abysmal failure, but she would have said why in a cogent, incisive, powerful way. That sort of criticism matters. It’s part of the fail, fail better ethos, I think. Or, if she enjoyed it, the review would still, I’m certain, be cogent, incisive, and powerful—but it would be saying different things, equally useful and important things. And, really, I just would like to know what she thought of this effort, as she wrote so many grand stories herself that dealt with these issues of gender and sexuality. Yeah, I would have picked Russ, too. Let’s talk about community now. I’ve seen a lot of public support for this project on the Outer Alliance list (and reviews on Autostraddle and io9). How helpful has what community been in the creation, and sale, and now marketing, of this book? The speculative, queer, and queer/speculative communities have been immensely, ridiculously, wonderfully helpful throughout the whole process. The outpouring of support, advice, and interest was stunning, from the moment I announced the call for submissions onward—and, in the story-solicitation process, folks were for the most part enthusiastic about the project and wanted to be part of it. People gave me books, sent me story suggestions, and offered literally hundreds of ideas about potentially useful avenues of research via email, my blog, and Twitter. When I opened the call for submissions, I had a huge influx of stories—and, what was really fascinating: many of the people who were submitting also made suggestions for other stories in their cover letters. So, they would be sending their own work in hopes of making it into the book, but also telling me: “hey, here’s another story I loved, too.” That was kind of beautiful, and showed, I thought, how much support the community was offering the book. People saw the call for submissions all over, too—some from Lambda Literary, some from speculative communities, etc. And, as I said before, the sale of the book was really a matter of community also—Steve at Lethe knowing I wanted to embark on this project, and taking a risk on giving me the opportunity to do so, though I had no prior experience. The marketing has been hugely community-driven, too, in a way that I think every writer/editor hopes for. The authors in the book have been great about spreading the word, publications from both communities have given it a lot of attention, and I know there are some great reviews and other things forthcoming about it from sources I never would have expected. Hell, my university department decided to fund, host, and advertise a release party—and that’s the academic community. I wanted to do Beyond Binary because I thought we needed a book like it—and I’m indescribably moved by the fact that the community at large has been so clearly, publically, awesomely excited about it, too. It’s really all I could have hoped for. I mean, look at this artifact right here—this interview. Support in action! Whose experience and advice did you seek before/during/after bringing the book into being? What would you do differently? I asked for a lot of advice over the course of creating the anthology. For one thing, I asked the internet at large, all the communities of which I was a part, for help finding stories. I knew that there was no way I had read everything, or could find it all on my own. 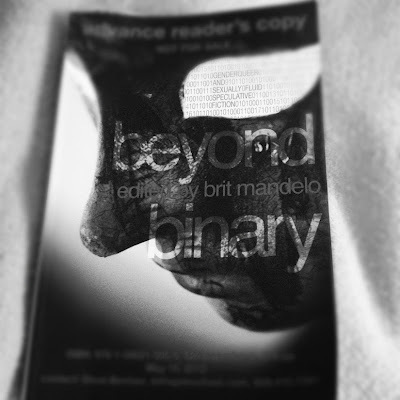 That was sort of the impetus of Beyond Binary, anyway—that these stories were out there, but dispersed and hard to find. I’m not magic; I knew I needed help to find things. I’m sure I still missed a lot, even with the help and advice I received. On a smaller scale, I sought advice on things like how to ask for blurbs, and what a story solicitation letter should look like, and whether I should send them to the authors or their agents—all of that important technical stuff. After the book was put together, when it came to marketing and party planning and all of those complicated things, the seasoned pros that I know, and who are in the book, have been indispensable. Ellen Kushner and Delia Sherman have been a great help through the process—advice, guidance, and experience were all on offer. Without them, we probably wouldn’t be having a book release party at WisCon! You don’t realize exactly how much you don’t know, until you run smack into it. There were a lot of moments like that, and I keep having them even now that the book is in distribution. In fact, I solicited some panicked advice about what to do at a release party where I’m supposed to entertain a crowd for an hour, last night, from the person who’s running the event and does these kinds of things often. And then I asked some other writer-friends, too, for good measure. But, looking back, I think I would have liked to have spoken to a few more experienced editors about things like how to organize the table of contents, what their guiding philosophies were, and how they handled author correspondence—those sound like almost very business-y sorts of things, but they were where I felt my lack of experience the most. I was under the wire by the end of the process, though, and didn’t feel like I could impinge on folks’ time to ask for some advice. Maybe if there had been a convention around that point I would have done so, hah. I’ve had opportunities to ask for advice since then from great sources like Ellen Datlow, in the context of my new job at Strange Horizons, and some of the things that I’ve been told by more experienced people since putting together Beyond Binarywould have been helpful at the time. Simple stuff, like I mentioned above, that I was just fumbling my way through. I’d ask you what your secret goals were for this book–but then they wouldn’t be secret anymore. So tell me some of the pitfalls you think you’ve avoided (or not) in the process. I hope that I’ve included a diverse set of voices in the book, and an even more diverse set of stories. This is at once a pitfall I’ve avoided and tripped into, though—as I said before, I know that the book isn’t a complete picture, and that I’m lacking in several sorts of stories. Yet, I feel like in what is there, there is diversity across and off the spectrums of gender, sexuality, age, race, and culture—from a teen girl living in poverty who is exploring her attraction to both men and women, to stories like those we talked about above, that are dealing with complex nontraditional relationships in secondary worlds, and fluid or alternative gender identities in a contemporary setting with elderly protagonists. I hope that I’ve avoided the pitfall of a single story, a single narrative about what “genderqueer and sexually fluid” means, or can mean. What is the greatest joy or satisfaction you gained from the experience? Seeing people’s responses to the text has, by far, been the greatest joy in a series of joys. I thought at first that it would just be the chance to read so much great genderqueer and sexually fluid fiction. I loved that, certainly! So much good reading. There was also the satisfaction of contributing this book to the greater conversation, foregrounding these stories and voices where they’re so frequently invisible, absent, or ignored. But, in the end, it’s the reader response and the fact that this book seems to be doing what I so wanted it to do: offering people a vital chance to see their own stories spoken, and stories about people like themselves. And people are saying that yes, they are happy to see this book on shelves, to have these voices emphasized—that it means something to them. There’s nothing more powerful than that, for me. I have a couple of short stories forthcoming, in Apex Magazine and Tor.com, and I’m currently working on several other short pieces, plus doing research for a potential novel project. Also, editorial work at Strange Horizons, which continues to be great and really absorbing. Balancing writing, editing, criticism, and everything else is a little crazy at the moment. As for Beyond Binary, there will be a book-party with several contributors reading from their stories, plus tea and cookies, at WisCon 36 in Madison WI, May 25-28th! That sounds like a party I’d enjoy. I’m just sorry I can’t be there. Have a blast! Sell many copies of Beyond Binary!